The UAE is blessed in many ways and one of these is that within this rather small country there are many different landscapes. Geologists would say: the topography varies from coast to coast. On the Arabian Gulf coast are low-lying sabkha flats and small mangrove stands bounded by calcareous dunes. Further inland are lightly vegetated sandy deserts of varying chemical composition, which in turn give way to gravel plains and wadis as the Hajar mountain range is approached. The mountains rise to 1200 meters within the UAE (but up to 2800 m. further north in the Musandam Peninsula) and contain bare, rocky peaks, cut by deep, winding wadis. Each of these habitats has its own micro-climate and micro-environment, which in turn affects the distribution of the flora and fauna. Parallel to the Hajar Mountains and a few kilometers inland there is a range of lower limestone mountains. These used to be the beaches of an ancient sea – the sea of Tethys. When volcanic action at the bottom of this sea caused the ocean bottom to rise and fold (and form the Hajar Mountains), the beaches also rose and folded and now form fossil bearing hills dating from the Tertiary era. The Jebel Hafeet anticline is the largest of several Tertiary antiforms, aligned along the western flanks of the Hajar Mountains. The massive mountain is cut by several wadi systems that flow out on both the eastern and the western side. It rises nearly 1300 m above sea level and is located immediately south of Al Ain, straddling the border between the UAE and Oman. It is easily visible from space. From below it looks like a “beached whale”, as Wilfred Thesiger once described it. It is asymmetrical – on the west it dips at about 25 to 30 º while on the east it is much steeper. Faults are abundant and include normal (extensional), strike-slip (wrench) and reverse (thrust) types. To geology students it is of special interest, because the mountain is eroded in such a way that the composing layers can be easily observed at the surface. In geology jargon Hafeet is the type locality for two major formations: the Hafeet formation and the Seniya formation. (A third formation present is called the Al Jaww formation). Both are rich in deep sea planktonic fossils called foraminifera. At the foot of the mountain, close to where the road from the cement works passes through a man-made gap, fossils of branching corals, oysters, gastropods and more rarely sea urchins and pieces of barnacles and crab claws can be found. One type of fossil that is special to this mountain is called ‘nummulites’. When I first found these, they reminded me of potato chips – thin round pieces of rock, often a bit curved. Where they are broken, a delicate structure of round and transverse septums can be seen. These nummulites are the remains of a now extinct one-celled organism, varying in size from 3 to 15 mm. For non-geologists like myself, the mountain and the surrounding area have many other interesting features. In fact, the mountain is so special that it was surveyed intensively in 1997-1998 with a view to having it pronounced a national heritage site or nature reserve. The report of this survey organized and financed by the Emirates Natural History Group (Abu Dhabi) makes fascinating reading for anyone wanting to explore the mountain. Unfortunately to this date the area has not been declared a reserve officially and that has some sad consequences. For the sandy plain at the foot of the northern tip of the mountain was the one and only place in the Emirates where the pretty yellow composite plant called Anvillea garcinii was found. The last time I searched for the plant (in 2003) the whole area had been destroyed by indiscriminate criss-cross driving, while the drought of many years had also taken its toll. No live plants could be found at that time and it is quite possible that by now this rare plant has become extinct in the UAE. We did see the very fast-moving lizard Acanthodactylus opheodurus – another rarity, running between the dry bushes. The wadi that runs out of the mountain onto this plain is called wadi Tarabat, the finding place of the nummulites fossils. A bit higher up in the valley are the only UAE specimens of the large bush Acridocarpus orientalis, while on the main part of the mountain lives the elusive little ungulate the Arabian tahr. The tahr, a delicate small goat-like animal, was thought to have been extinct in the UAE since 1982 when a carcass was found near a water hole on Jebel Hafeet. However, after the tahr was rediscovered in the Hajar mountains in 1995, a male tahr was seen near one of the parking lots by bird watchers in 1997. Since then several other records have been made by local environmentalists. During the ENHG survey the presence of the small mountain fox Vulpes cana was comfirmed by Chris and Tilde Stuart, South African wildlife researchers, who had made the first record of this pretty fox during their 1995 survey of the Hajar mountains. 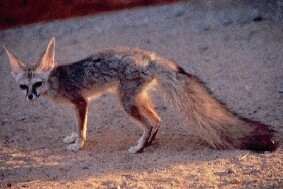 There are also Red foxes (Vulpes vulpes) to be found on the mountain. They seem to use the mountain as a base from which to make feeding forays into surrounding desert and farm areas. Introduced to the mountain as an escapee from a local animal collection was the rock hyrax (Procavia capensis) - a small rodent, common in Africa and indigenous to more southern parts of Arabia. It used to be a favourite food of the Arabian leopard (Panthera pardus nimr) that still occurs in small numbers in the Hajar mountains. The hyrax on Jebel Hafeet should be safe from leopards as it is unlikely that the Arabian leopard ever occurred there. Whether the colony survived the recent long years of drought is another matter. No recent records are available at the time of writing this. Tortuous cave systems have been carved into the mountain when vast volumes of water percolated into the bedrock via open and interconnected fractures and through the more permeable limestones. Several such systems have been explored to a depth of 150 to 450 feet. Some caves contain excellent stalactites, stalagmites and other cave tufas. These caves were home to up to seven species of bats, the most common being the Muscat Mouse-tailed bat (Rhinopoma muscatellum). Unfortunately, most of the accessible caves have either been blocked by the Al Ain Municipality for safety or have been plugged naturally by sediment fill. 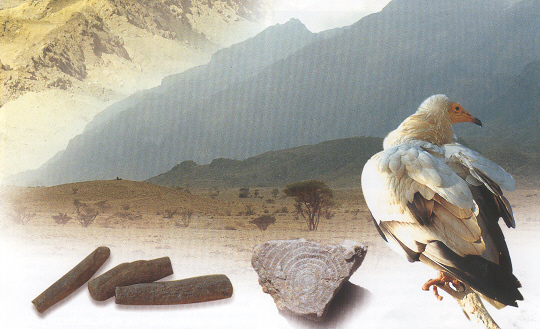 For bird lovers the Hafeet mountain is unique because of its special suite of species, not found in any other mountain area of the UAE. Up until the early 1980’s huge Lappet-faced vultures (Torchos tracheoliotos) nested on the mountains and for many years it has been home to a thriving colony of Egyptian vultures (Neophron percnopterus). They lead an easy life, finding food in Al Ain zoo that is located at the foot of the mountain. Other birds of interest to visiting twitchers are Hume’s wheatear (Oenanthe alboniger) as well as the Hooded wheatear (Oenanthe monacha) on the lower slopes, while Rock doves (Colomba livia), Barbary falcons (Falco pelegrinoides) and Brown-necked ravens (Corvus ruficollis) can be found on the summit. The Jebel Hafeet Survey report records no less than 119 species of bird residing in, visiting or passing through the Jebel Hafeet area. Insectwise the mountain is also a lot less empty than one would think. Over the last decade Mike Gillet has made extensive studies of UAE insects, and his species list for Jebel Hafeet reaches far over 200 while he himself points out that this list is not exhaustive. Some of his recorded species are as yet unidentified. Of interest to casual visitors of the mountain are the butterflies, grasshoppers, and scorpions. The butterflies are represented by 23 species, of which the Common Swallowtail (Papilio machaon) is the largest. The Caper white (Anaphaeis aurota) is a true migratory butterfly that has the Caper plant as its food plant. Of the many species of grasshoppers the odd-looking Towerhead grasshopper (Truxalis procera) occurs in both a green and a light brown form. 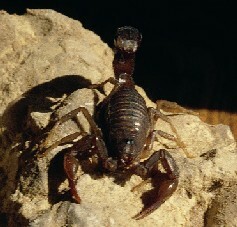 Scorpions are nocturnal and will not be encountered very easily. 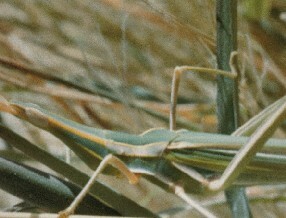 The large and dangerous Androctonus crassicauda is not easily overlooked, if it is disturbed from its dark hiding place. Archeologists will be intrigued by the presence on the north and east front of the mountain of 317 tombs dating to 3200-2700 BC. Excavations of only 25 of these tombs so far have yielded pottery, stone beads and bits of copper, but no weapons from a culture that is unlike any other found so far in the UAE. The pottery was not locally made but imported from Mesopotamia. This suggests that these people had trade links with Mesopotamia. There was also trade with the Upper Gulf as indicated by the find of a so-called “Dilmun” seal, dated to the late third or early second millennium BC. Hafeet type cairns are found all over the south-eastern Arabian Peninsula – as far north as Khatt near Ras al Khaymah and as far west as Umm an Nar island in Abu Dhabi. During the nineteen eighties a double lane highway was constructed leading to the top of the mountain. Along this road and on the summit several large parking lots have been developed affording spectacular views across the city of Al Ain to the north and the sand dunes of the edge of the Empty Quarter to the west. More recently palaces were built and a luxury hotel opened several years ago. On the west side of the foot of the mountain are some hot springs and a recreational area has been established featuring a huge fountain in the middle of pleasant park surroundings. Even a drive on these tarmac roads can show the visitor a little bit of the diverse nature that the mountain harbours. Unusual plants like Iphiona scabra and Cleome pruinosa can be found in the roadside gullies, while among the rocky debris one can find cherts, calcite crystals, marls and gypsum. Small lizards (Phrynocephalus arabicus) can be spotted sunning themselves on the rocks. Some of the stony cliffs are festooned with caper plants (Capparis cartilaginea) with their spectacular white flowers that can only be seen open on early summer morning. In fall, the fruits burst open when ripe, revealing a blood-red pulp with many seeds. Other interesting, though not very spectacular plants are Echiochilon thesigeri, with its multi-coloured small flowers; the small red pea flower of Tephrosia apollinea and the rare Periploca aphylla with its strange white-fringed maroon flowers. During the ENHG survey over 200 species of perennial and annual plants were recorded on Jebel Hafeet. Standing on the last of the parking lots one can look into a valley that runs through the heart of the mountain. Once I climbed there, long before the roads reached this far. The mountain had been truly “empty” then (“hafeet” means “empty”), but only empty of people. The presence of three hikers made no impression at all on the vast silence of the big rock. We were specks on the face of the cliffs. I had sat down to enjoy the silence and the view. A rock thrush in a nearby bush had sung its song for me. After a while it flew up and glided towards me, landing lightly on my head for just a moment before it flew on. Around 500 million years ago, much of the Arabian landmass was covered by shallow seas that evaporated under the hot climate, leading to the formation of thick salt deposits. Another ice age occurred in the Carboniferous time some 400 million years ago. Later, when Gondwana collided with Laurasia to form the super continent of Pangea, more folding and faulting occurred in Arabia. The seas flooded the area once again, in the early Cretaceous, leading to the formation of shallow water limestones, which now are the places where you can find marine fossils. In the late Cretaceous, there was movement originating from volcanic action in the seas to the east. This caused the dark, dense crustal magma extruded by the submarine volcanoes to be pushed up, giving rise to a tremendously thick sequence of so-called ophiolite rocks, which are the main type of rock in the Hajar mountains. Ophiolites are typical of such spreading centres and provide the geologist with relatively rare access to rocks that are amongst the most representative of the deepest parts of the Earth’s crust. In fact, the ophiolites of the Hajar Mountains are the most extensive in the world. In the hot and humid climate they eroded rapidly. During the Palaeocene and Oligocene (65-23 million years ago) sea levels rose and fell several times. The coastal region was periodically covered with warm tropical waters. After that the area became tectonically more stable but it began to separate from Africa along the Red Sea Rift about 25 million years ago and is currently moving northwards at an average rate of 5 cm per year. As it moved north and was pushed under Eurasia, the Zagros mountains in Iran were formed. The straits of Hormuz closed and in the rapidly subsiding basin thick layers of salt and gypsum were deposited. The collision caused large scale folding of the limestones, evidence of which can be seen in Jebel Faiyah and Jebel Hafeet. The UAE coast rose above sea level in the late Miocene/ early Pliocene (5 to 2 million years ago) and the Arabian Gulf filled with water again about 4 millions years ago. Fossil evidence shows that in the late Miocene there were lush riverine valleys in the west of Abu Dhabi with savannahs populated by elephant, giraffe, rhinoceros and many other animals. About 8000 years ago the lowered sea level allowed sand to be blown into Abu Dhabi from Saudi Arabia and in the last 6000 years the Arabian climate has become steadily drier.